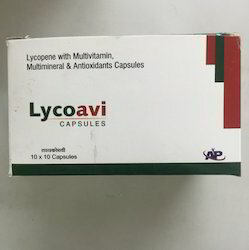 With enriched industrial experience and knowledge, we are providing a qualitative grade of Lycopene with Multivitamin, Multimineral & Antioxidants Capsules. The offered capsules provide wide range of antioxidant activity and support skin, eye and immune health. These capsules are processed by our experienced professionals using superior grade chemical compounds and contemporary processing methodology at our production unit. The provided capsules are thoroughly checked by quality experts on diverse parameters of quality in adherence to set industry standards. Established since 2016, "J. P. Healthcare", has emerged as professionally managed fast growing manufacturer and supplier of Pharmaceutical Products. Our wide range of products includes Pneumatic Tablet, Pharmaceutical Suspension and Pharmaceutical Syrup. Under stringent norms, our products are processed by taking best quality compound and all our products are passed through rigorous quality assurance procedures. We are associated with reputed and certified vendors, who help us, cater to quality product requirements of our clients. Owing to our large production capacity, we have been able to effectively meet the bulk orders. Our mission is to be among the spectrum of top Indian pharmaceutical companies and spread their wings across the globe. The company is poised for vertical growth, with modern facilities, a resolute workforce, state-of-the-art work environment, knowhow and resources that are at par with the best in the country. Leveraging on our well equipped and productive processing unit, we are able to cater the bulk demands of the offered pharmaceutical products in the best and effective manner. We have been backed and supported by a team of skilled professionals that is trained at regular intervals of time through seminars and workshops. We aim to not only expand our business scale and scope but also have a special interest in serving the needs of the end consumer that requires our products the most. The company is moving towards a long term goal of development, manufacture, marketing and sales of useful pharmaceutical products.